When I learned that I’d be part of the Macworld Video production team, I was both excited and more than a bit apprehensive. 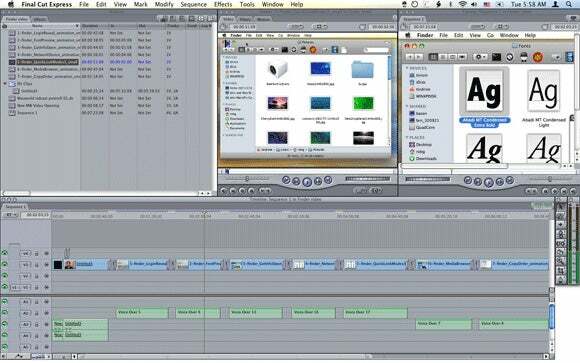 I was excited because I enjoy working in video, though it never seems I have enough time to do so, and nervous because Apple had recently (with the introduction of iLife ’08) basically killed off my video production tool of choice: iMovie HD. iLife ’08 includes a program named iMovie ’08, but it’s related to its predecessor in name only—iMovie ’08 is a completely new program. While iMovie ’08 added a number of interesting features beyond those offered in iMovie HD, it also removed quite a few, and more importantly to me, created a completely new paradigm for video editing. In a typical video-editing app, such as iMovie HD, you have a spot to store your video clips, and a timeline on which to place them. In iMovie ’08, however, the traditional timeline and storage bin have undergone major changes—your videos are shown as a series of still images in both the bin and timeline area, and a traditional timeline view is not available. For my first two Macworld video productions, I used iMovie ’08, trying my best to adjust to the new way of doing things. Even though I was able to create both videos, and the end results were fine—at least as fine as my talents allow—I wouldn’t say either production was an enjoyable experience. I worked too hard to understand the iMovie ’08 way of doing things, and it seemed that many simple tasks, such as making a cut on a precise frame, were either impossible or more complicated than they were in iMovie HD. As you can see, each clip is represented as a number of stills, and there’s a thin break between each clip. As you move the mouse over the clip bin, the clips play both audio and video—I found this very distracting and not at all useful. In addition, if you’re using the mouse like this to preview clips, you have to drag it from the rightmost edge of the frame back to the left in order to continue playing the clip when it spans more than one row. Overall, I just couldn’t adjust to this new paradigm, finding it imprecise, visually busy, and not at all intuitive. As you add more and more clips to a project, there’s a lot of scrolling around to find the portion of the clip you want to use. I also missed many of iMovie’s effects, and the more-logical manner of handling projects—iMovie ’08 automatically creates “events” when you import video, but I tend to think in terms of projects, and prefer direct control over such things. For a while, it seemed that iMovie HD was going to be my only option… but then, just before I was set to start working on the latest video, Apple released Final Cut Express 4, and dropped the price $100 in the process ($199 new, $99 upgrade). Somewhere in my deep past, I had purchased a previous version of Final Cut Express, and so, with a $99 cost of entry, I decided to take the plunge and try to learn something new… of course, choosing to do so with a video blog due in only a couple weeks may not have been the best decision. However, after launching Final Cut Express, I sensed the transition would be easier than expected. The interface is much more traditional, with a bin for clips, a viewer window for creating segments out of those clips, a full timeline with support for multiple audio and video tracks, and a canvas in which to view your final composition. At the top left of the window is the bin, showing 10 clips and the default sequence. Compare the amount of space used for those 10 clips with that taken up by only three (and a half) clips in the iMovie ’08 screenshot above. Not only can you see many more clips in a smaller space, but with the ability to assign each clip a name, I can actually see more info at a glance than I can in iMovie ’08. If you want to see any of the clips, a double-click will open one in the Viewer window to the right. (This is also where you set the clip’s in and out points, which controls how much of the clip is used in the timeline.) To the right of the Viewer is the Canvas, where you view the production you’ve created on the timeline. I spent some time with the user manual, and then basically just dove into my project. Things went relatively well, although there were adjustments to be made. My screen captures, for instance, had to be reduced to 640-by-480 before I brought them into Final Cut Express, whereas iMovie ’08 seemed to handle any scaling that needed to be done. Titles, which are basically automatic in iMovie ’08, need to have fade in/out added manually in Final Cut Express. But those minor annoyances aside, I found working in Final Cut Express to be more intuitive, faster, and more pleasant than working in iMovie ’08. There were no annoying audio and video previews as I moved the mouse over clips in the bin; and the ability to have more than one video track allowed much greater flexibility. The independent audio tracks allowed me to replace a video clip that had to be reshot without having to re-record the voiceover, and having access to a wide variety of effects and titling options should allow more creativity in future projects. To take my learning even further, I’ve started working my way through the just-released Apple Pro Training Series: Final Cut Express 4 manual. I haven’t gotten very far yet—holiday obligations have taken precedence—but I’ve already learned quite a bit about the language of video production, and how the Final Cut Express interface works. The book includes a DVD packed with sample projects, so you can apply what you’re reading to actual Final Cut Express 4 projects as you learn. Once I’ve worked my way through the book, I’ll hopefully have more to say about it, for anyone contemplating making the leap as I’ve chosen to do. As of today, I still know almost nothing of Final Cut Express’ capabilities—I learned just enough to get through my video blog project. The good news is that, for one experienced with iMovie HD, the transition to Final Cut Express really shouldn’t be all that hard—at least in terms of being able to get a simple project done. And now I’ve got a few weeks “off” in which to learn even more before its again time for my turn in front of the camera.